Russian Comfrey, Bocking 14 (Symphytum x uplandicum)- Russian Comfrey. Bocking 14 variety. Member of the borage family, The roots and leaves contain the valuable cell-proliferant allantoin. A salve or poultice made from the leaves and applied topically is said to promote healing of bruises, sprains, and broken bones. Mature plants feature large dark green somewhat hairy leaves up to 18" long. Russian Comfrey is sterile. High in protein and potash, comfrey is commonly grown in the garden or added to the compost pile. Also used as a forage crop for small animals and poultry. 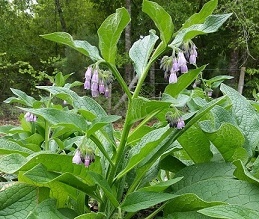 (Please note: the FDA has advised against using comfrey for human consumption due to the high content of liver-toxic alkaloids contained in the plant.) Perennial zones 3-9 Live plant in 3 inch container.